It’s probably no great surprise that I’m not a huge fan of the Barbie movie franchise. However, the girls love them, so when we got the chance to review the new Barbie movie, Barbie The Pearl Princess, there was no way I could turn it down. 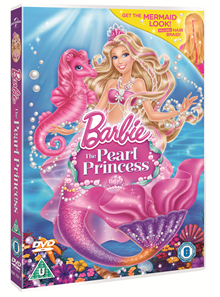 Barbie appears in this movie as Lumina, a mermaid with special powers that allow her to control pearls, making them dance and glow amongst other things. But Lumina has spent all her life hidden away from the world, living with her aunt on the outer edges of the mermaid kingdom. She dreams of one day visiting the royal palace, and when an opportunity comes up to do just that, Lumina and her seahorse friend Kuda set off on an adventure that brings Lumina more than she bargained for. 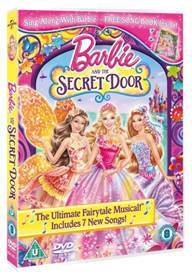 The animation in this movie was great, and a real step up from some of the previous Barbie movies I’ve seen. The music was pretty good too, particularly Mermaid Party which managed to sound like a load of recent chart hits without sounding like a rip-off of any of them. The story, though, left me a bit cold – there was no real sense of surprise or danger, and you can probably work out how things end up from the title alone. That said, I’m not really the target audience, and the girls enjoyed it well enough. Heather gave it a solid 3 out of 5 (although I’m not sure she really understood what I was asking) and Megan has watched it several times, so clearly she enjoyed it too. Also, she got really excited about the posters and trailers we saw in the cinema at the weekend (as well as it’s DVD release, the movie has a limited run at Vue cinemas) which proves how much she liked it. What do I know?